For every rebuilding or renovation job, a paint scraper will be needed. 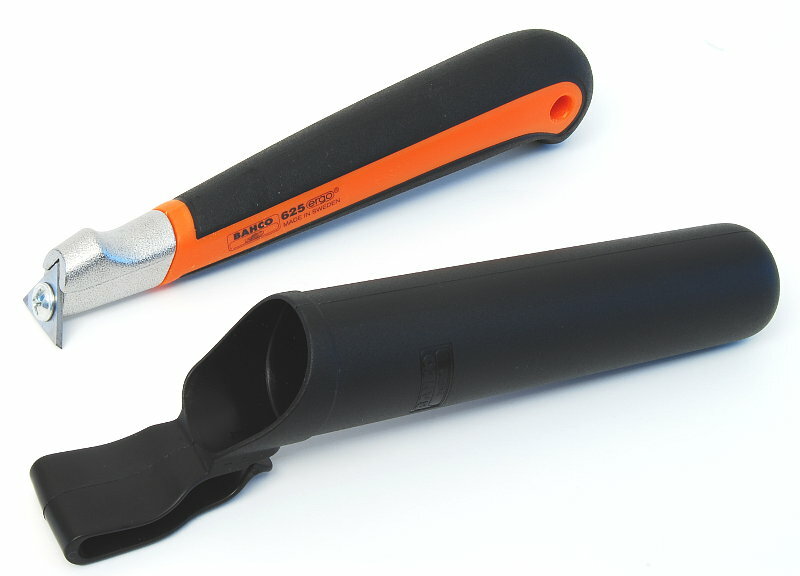 The Bahco paint scraper (before Sandvik) exists in three models with many blades that also allow precise work on difficult profiles and moldings. The glue scraper by Kunz is extremely robust and the blade can be resharpened. Have a look also at the Veritas paint and glue scraper, which has an adjustable ball-joint head, allowing a variety of uses, even as a cabinet scraper for fast work! With this pocket paint scraper, you can work very precisely. Suited for window mutins, boats, and anywhere with small or difficult-to-reach surfaces. With the carbide blade, you can strip paint, glue and rust off any base material - wood, metal, cement, plastic. The two-component handle allows a solid and comfortable grip. The narrow front end and thumb indent provide both precision and pressure. The tool comes with a triangular blade and a sheath. The blade can be rotated to save money and time. The Bahco Ergo 625 is very versatile when used with teardrop-, pear-, and round-shaped blades. This universal paint scraper, is very effective on paint, glue, varnish and rust on any base surface - wood, metal, concrete, and rust. The two-component handle allows a solid and comfortable grip. The narrow blade mount allows easy access even in difficult-to-reach areas. NOTE: The scraper blade is very slightly convex (1/10 mm) to help prevent the corners from digging into and scratching large surfaces. But it also works very well on corners and edges, simply tilt the blade slightly to the side! This universal paint scraper is meant for quickly removing large areas of paint, glue, varnish and rust from any base material - wood, metal, concrete and plastic. An extension grip allows more pressure to be exerted on the work piece. The two-component handle provides a steady and comfortable grip. The narrow blade mount provides for easy access even in tight corners. The Bahco 50 mm scraper blades will also fit this scraper. With exchangeable blade and cutting edge on two sides, with cast iron handle. Width of cutting edge 55 mm, Length 32 cm. For any major scraping work, nothing beats a ball-joint scraper. The handle can be set anywhere in a 70° cone, allowing a comfortable grip and effective blade orientation in virtually any circumstance. The handle unlocks or locks solidly with a quarter turn. Another advance on its predecessors is the hand rest on the blade. Substantial pressure can be applied to speed work. Made by Veritas! Enlargement and instructions! A Scraper with carbon steel blade is used for finishing bare wood surfaces where maintenance of a finely formed edge is more significant. The 75 mm x 75 mm x 1.6 mm (3 inch x 3 inch x 1/16 inch) blade comes with one edge bevelled. You may wish to bevel one or more others, but it also works perfectly well treated as a heavy-duty cabinet scraper with square, burnished edges. As above, but with carbide blade. Carbide-blade style is preferred for paint scraping. The 51 mm (2 inch) long carbide blade requires a specially designed holder and both edges can be used.